This week's Makeover Monday was inspired by a typo in an email exchange with Andy and me. I had thought about doing the Global Peace Index this week, but accidentally typed "Peach" instead of Peace. 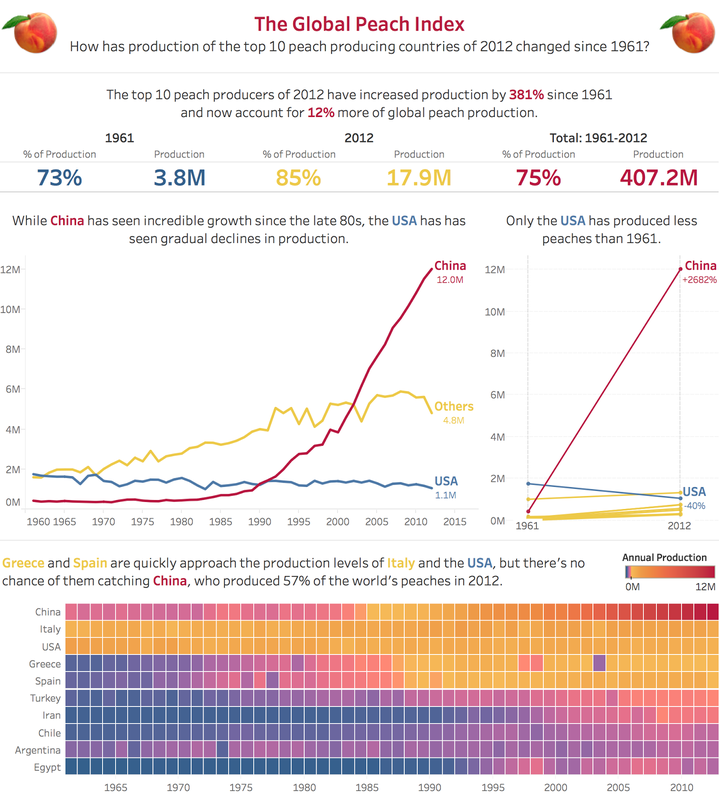 Andy pointed it out to me, but then I thought, I wonder if there is a viz and data about global peach production. And thanks to FAOSTAT there is! Who knew?!? Their data set is accompanied by a series of chart. I'm going to focus on their map. It's a map, so I can easily understand that it's show geographic distribution. The color scales don't make sense. Are they ranges? Are they precise values? There are a lot of yellow countries/ What does that mean? The blue water makes it hard for the blue shading on the map to stand out. The mapp wraps and repeats. 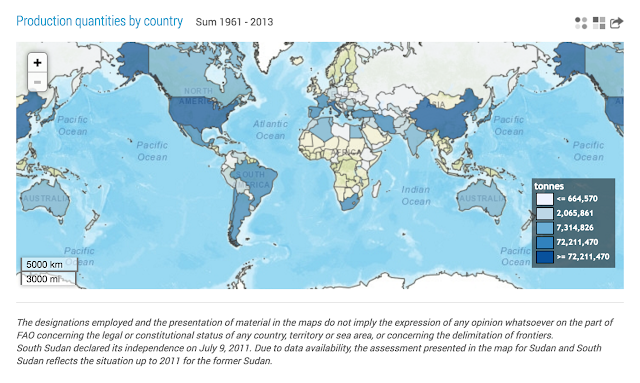 Comparing countries on a filled map is nearly impossible. How does China compare to Holland? If you can't answer questions like that, then a filled map is not the answer. For my version, I wanted to focus on the top peach producers in 2012, so I created a set that only includes to top 10 countries of 2012. I started with a summary, then an view over time, followed by a heatmap to help highlight the differences.